Hi all! Liz here, the therapist that works alongside Robyn and Crystal at Real Life Women’s Health. It has been such a long time since I have checked in here on the blog! 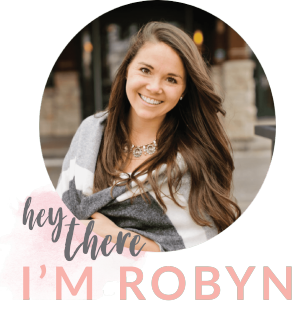 There have been so many changes in my life since my last post, and so many changes in this Real Life Women’s Health space too with Robyn becoming a momma. Welcome baby Cal! How about you all? Has this season of life been full of change too? Some of us welcome and like change, but in my experience, I’ve noticed most of us struggle with change. We are scared of the unknown and would prefer to stay in familiar spaces, even if that is hard too. We often put a lot of energy into trying to prevent change and control our life so that “things stay the same.” But what I’ve learned is that life keeps happening so I spent a lot of wasted time and energy trying to avoid and block what I now know is just the natural flow of life; it is ever changing. When I was fighting change, I ended up feeling as if life was against me and it was an uphill battle. This was not a fun way to live and I was exhausted ALL THE TIME. I also see this ongoing battle with the wonderful women I work with every day. They are spending so much of their precious time, energy, and finances trying to control their body size and ward off the natural changes we inevitably experience in our lifetime. Like having more fat tissue around our bellies and hips so we can grow and nourish a human life, or more cellulite on our thighs from journeying through womanhood, or our hips becoming wider as we mature from young adult to 30 something. Our bodies are forever changing. Three things can happen with your body when you being the intuitive eating journey. Your body will get bigger, your body will get smaller, or your body will stay the same. 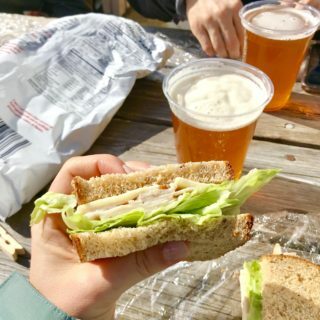 In my work, I’ve found that once we start intuitively eating, many, but not all, of us experience our bodies changing in a way we don’t prefer. And for many of us, this can be one of the most difficult parts of the recovery journey. It can feel physically uncomfortable, mentally painful, and emotionally it often is a grieving process of the “thin ideal” we have held so tightly. Working our way through these body changes is imperative. So if your body is changing right now because of the amazing, brave work you are doing I want to offer a few questions, journaling ideas, and tools that might be helpful. I also want to applaud and hug you for being courageous and caring for yourself! What else am I gaining? 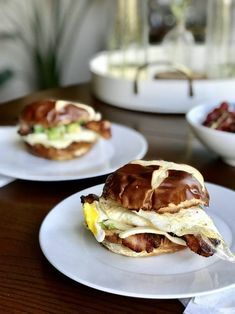 One of my favorite questions to ask women when we begin discussing the weight gain they are experiencing after letting go of food/exercise rules is: “What else are you gaining in this process?” The answers are often profound: I am gaining more flexibility, freedom, connection, presence, energy, trust. I also ask them to be more specific because really deeply understanding how recovery improves our life on a daily basis is motivating. For example: I can go to brunch with my friends and drink mimosas and order pancakes, I can say yes to spontaneous ice cream with my partner at the end of a date, I have more time to write, I feel more present and efficient at work, I am kinder and more patient with my mom, etc. What answers come to mind when you ask yourself, “What else am I gaining? What else do I hope to gain? How did I live out what deeply matters to me today? What did I offer to myself and others? I often hear advice given regarding body image work to the effect of, “When feeling critical of your body, name a part of your body you like?” I disagree with this piece of advice and find that it is often not helpful for long term healing. 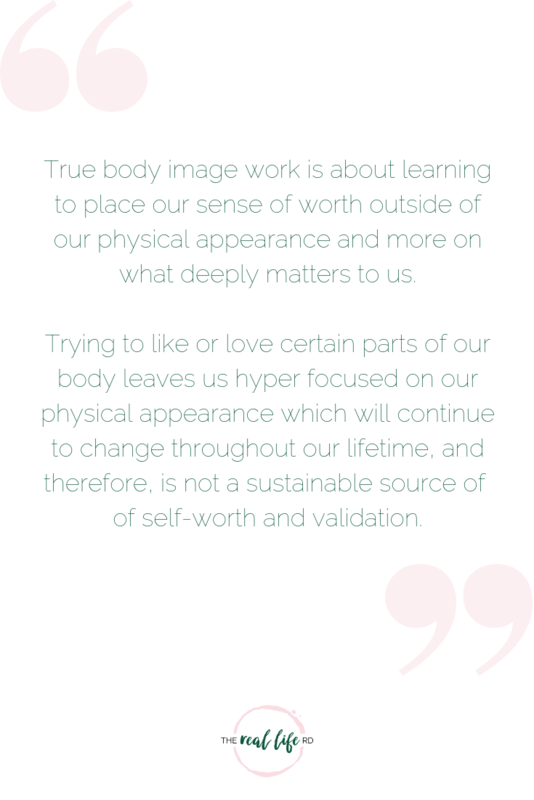 True body image work is about learning to place our sense of worth outside of our physical appearance and more on what deeply matters to us — our core values. If we just start focusing on parts of our body we “like” that still leaves us hyper focused on our physical appearance…which will continue to change throughout our lifetime, and therefore, is not sustainable as our primary source of self-worth and validation. When you notice struggles with your current body changes, name something else valuable or meaningful that you bring to the world. 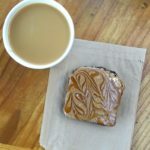 For example, “I was patient today when waiting for my kids to get ready for school.” “I was helpful to my coworker when they didn’t know how to answer an email.” “I was brave and ate that donut I was scared to eat.” “I sent my friend a silly text because I knew she was having a hard day.” Ask yourself how you showed up in the world and the gifts you offered yourself and others when you find yourself criticizing the body you did those things in. It can really shift your sense of self and mood! When else have I allowed for change and what was the outcome? Sometimes when change is happening it feels so scary and big and overwhelming that we tense up, dig our heels in, and try to keep things the same. In seeing our changing bodies, we have to let go of behaviors and ideas that are no longer serving us. For example…letting go of daily exercise, letting go of counting calories or macros, letting go of our scales. And so often I hear from clients, “I am just so scared, I don’t know where my body will end up at its natural set point. How much weight am I going to gain?” All of this unknown is scary and takes a lot of bravery. Sometimes it is helpful to reflect on our past experiences of being courageous and letting go of something that was no longer serving us even though we didn’t know what the outcome would be. Have you ever left a partner you knew was not right for you even though you were scared of being alone? 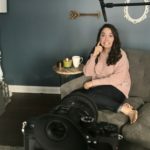 Have you ever quit a job that was zapping all of your energy and not utilizing any of your talents and you weren’t sure you would like your new job? Have you ever moved away from home to a new city or college? Often times our experiences of letting go bring us to new opportunities and experiences we didn’t even know were possible – such as finding your soul mate after ending a relationship that wasn’t right, finding your passion at a new job, finding a community you feel right at home in, etc. 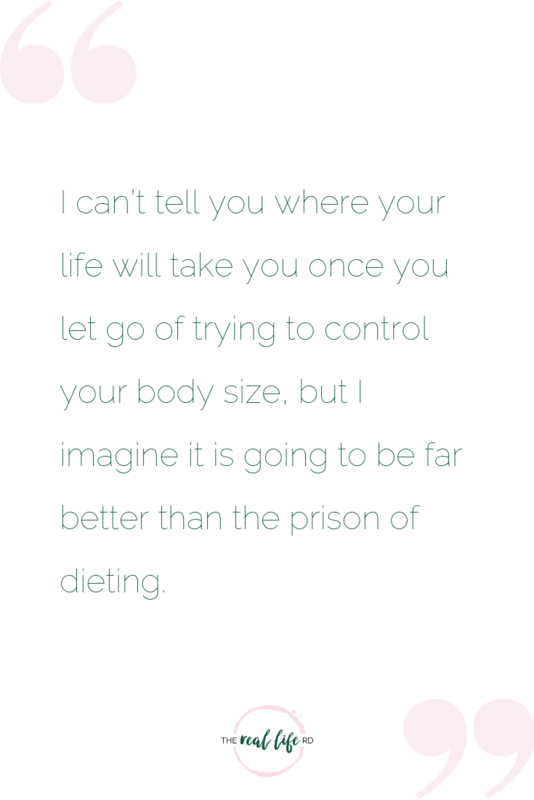 I can’t tell you where your life will take you once you let go of trying to control your body size, but I imagine it is going to be far better than the prison of dieting and will likely open space for joy, adventure, and new exciting experiences that you didn’t expect! No longer fitting into clothes that once fit can be one of the hardest parts of the process. I hear so many clients say, “but I love my clothes”, it feels like a “failure” to let them go. 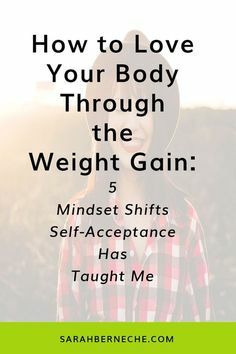 Or they say, “I am still hopeful I will fit into them when I really get this intuitive eating thing down.” However, I cannot emphasize enough how important it is to take this step. It simply isn’t kind to ourselves to wear clothes every day that are physically uncomfortable or constricting or to have a closet full of clothes you feel “taunted” by every time you walk into your closet. The way to be compassionate to ourselves and even protect ourselves on this journey is to buy clothes that fit our current body and to donate, trash, burn (whatever feels best!) the clothes that do not fit us anymore. If finances are tight, look at consignment shops, thrift stores or perhaps a friend’s closet. Clothing swaps are a great idea too. 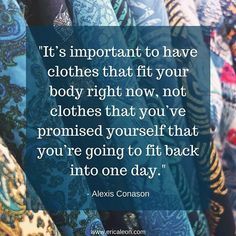 If you are intentional in your process, it can actually be fun learning to dress your new body and see what feels authentic and representative for you in this next stage of life. The experience of our bodies changing can feel a lot like the grieving process. It’s a process to grieve the loss of the body we envisioned we “should” have or did have. The stages of grief are: denial, anger, bargaining, sadness, and acceptance. I am sure you can reflect on how fearing or experiencing body changes has brought up feelings of frustration and sadness. 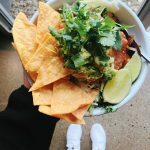 And denying that our bodies are meant to be larger, as well as bargaining with ourselves about how we can still try to control our body size if it is for “wellness or health” is all a part of this process that might resonate with you. That being said, I want to note that the final stage of grief is ACCEPTANCE. The final stage is not “love” or “positivity.” I think this is important because if we believe we are supposed to get to a place of loving and feeling ecstatic about our new bodies we very well might be setting ourselves up to feel like we are failing. Although I think it is wonderful to love your body and think it’s beautiful, that is not the goal of body image work. Rather it is about fully and unconditionally accepting our bodies as they are today. And accepting they will continue to change and therefore are not the determinant of our self worth and value. 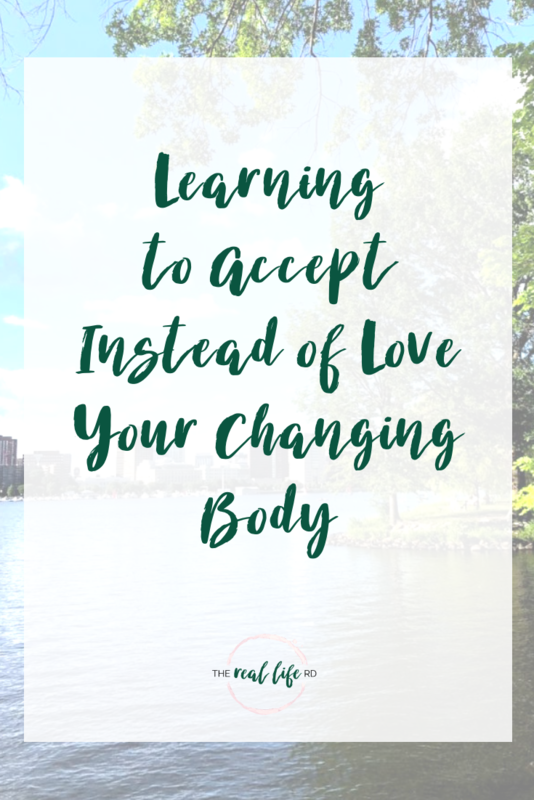 Acceptance means that we no longer have to fight or punish our bodies, but can instead keep them comfortable in clothes that fit, nourish them with foods that satisfy us, and let them move and rest in ways that honor their needs. In what ways can you practice accepting the body you are in today? You don’t have to continue fighting your body. That can be really exhausting. 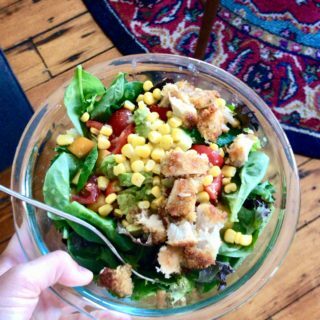 If you are struggling with body changes or negative body image on your intuitive eating journey and want to find freedom, but need some added support and a community of women with shared experiences, please join the next round of our Intuitive Eating Group starting on Tuesday, April 2nd! You can read more about this group and find more details here. We’d love to see you there! I love that this takes us out of focusing on our bodies and more on the things that really matter. Lately my family’s been reading the book of Luke in the Bible and it reminded me in chapter 12 of how much more important it is to lay up treasures in heaven and not constantly worry about what we eat or our bodies. Hi Emily! Thank you so much for sharing this beautiful reflection on your journey with accepting your body size in the present and all of the freedom it has brought you in your whole and full life…so happy for you! I do like the thinking and focus to love our bodies. However the IE way of believing seems like another way to “ soothe” one into thinking that your size(becoming into your true size…. larger), is just another form of “ it’s ok, let yourself go”. A false sense of letting oneself go. Any extreme , diets / letting go cannot be good. You make mention of non- exercise… eating donuts/ ice- cream, how can these sugars be good for our bodies? I see no mention of Cardio-Orthopedic-Diabetic-Dental issues that can/ will develop due to poor intake… poor exercising . 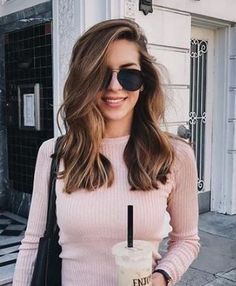 As the young Womon who adopts this become Menapauseal these “adoptive” ways of eating will steer into a overweight Woman and with the slowing of metabolism at this age, your health is at risk. There is balance and self restraint and one can still love their body…. when you love your body as an adult you learn how to care for your body. I just have a hard time with this as an “ extreme” mode of thinking. Cardio protection is important and our overweight population coupled with our own set of “ Genes”, creates more Cardiac Disease. I personally am a devotee of a good working out for all the wonderful things it does to make me a better me. Balance not extremes. Thank you for your blog and the opportunity to share- respect other views and to listen to each other as we all navigate this life. Hi there C. Thank you for commenting and sharing your views, I too appreciate having a space to respect and listen to others as that is certainly were a lot of growth can happen! I hear in your comment that you experienced this blog post as “extreme” in that accepting ones body leads to not caring for it perhaps? And that is certainly not what I believe true intuitive eating and health at every size approaches bring for us. Accepting our bodies allows us to actually listen to them and their needs for nourishment, movement, and overall well-being physically, emotionally, and mentally. Our body is on our team and has our best interest in mind and if we are listening it will guide us to what it needs, wether that be movement or rest or more protein or more fat in our food (etc) so that it can run most effectively for us. When we are accepting something for example our body and not fighting it we are able to actually be in communication with it and make decisions together. I hope this is helpful and thank you again.